23rd February was the date for our annual conference. The theme this year was Building Rural Futures. As per usual, the conference was held in Birnam (with the pre-conference evening reception being held at Dunkeld House Hotel). We were delighted to welcome around 100 delegates and speakers to discuss various subjects ranging from Island Proofing through to hutting and cooperative self-builds. Unsurprisingly, the Planning Bill was a hot topic and Richard Heggie of Urban Animation gave us a presentation of why EVERYONE should get involved in the discussion. A common concern throughout the event was the debate over providing housing where it CAN be delivered (in order to hit the Scottish Government’s 50k Affordable Homes target) as opposed to delivering housing where it is needed. Shortly after the conference, a report commissioned by Shelter Scotland, the Scottish Federation of Housing Associations and the Equality and Human Rights Commission in Scotland was published. The aim of this Review of Strategic Investment Plans for Affordable Housing (here) is to better understand how the Scottish Government target is likely to be delivered in practice and should help keep the discussions raised at the conference going. If you missed the conference or would like to have another look again at the presentations, you can find them on this page. We are absolutely delighted that the Prince’s Countryside Fund are to support the project again, for another 3 year period. This means that our project officer can continue to deliver housing projects across the Hebrides. The project will concentrate on finding affordable housing options for young people, delivering housing education workshops to secondary school pupils, developing social media and web based housing options and advice and securing funding for housing projects in the Hebrides. We welcome the news from the Finance Secretary at the end of last year of an increase of £90m in the budget for affordable housing. The Housing Minister has confirmed that the government’s 50,000 new build target for the next term, of which 70% will be social rent properties. How much of these will be rural we do not know but as always, we will be lobbying the government and working with local authorities, housing associations, development trusts and individuals to help create more affordable housing options for rural communities. 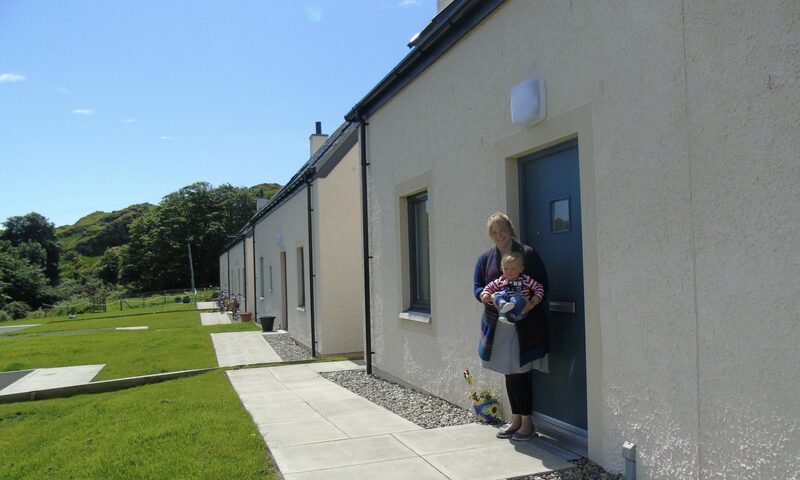 A new Rural Housing Fund is currently being developed by the Scottish Government, aimed at innovative community let housing developments. Rural Housing Scotland and Our Island Home will be able to help communities to develop applications to this fund. At Rural Housing Scotland, we are putting together final preparations for our Annual Conference which takes place on 25/26 February 2016 in Birnam. The title of this year’s conference is ‘Strengthening Communities’ and speakers include the Minister for Housing & Welfare, Margaret Burgess MSP, Professor Sarah Sherratt of SRUC, editor of Rural Scotland in Focus biennial reports and Dr Kim McKee from St Andrews University, who recently published the report “Generation Rent’ which focused on young people in the private rented sector. This is the premier rural housing conference in Scotland and we attract around 120 delegates per year from community organisations, housing association staff and senior government officials amongst many other sectors. We look forward to welcoming new faces and regulars. For more details and how to book, visit ruralhousingscotland.org.